The SB530T "Simply Elegant" is the second machine in the Simplicity by Brother Series. 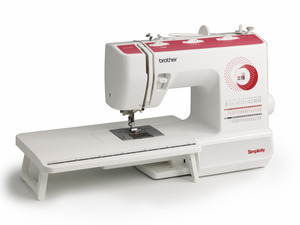 This machine features 53 Built in Sewing stitches, with a 1 step buttonhole. Select ulility, decorative, or stretch stitches with the easy stitch selector dial. Simply, this is the best entry level, mechanical, sewing, and quilting machine, created with you in mind! Includes a removable Wide Extension Table for Larger Projects. Remove for Free Arm Sewing around Cuffs and Sleeves. Adjustable Stitch Length and Width gives you greater versatility with your stitch functions.